Fortaleza Ceara, with its near perfect climate, spectacular beaches and low cost of living is still one of South America's best kept secrets. The Europeans are catching on while most North Americans and the rest of the world remain clueless! According to a recent US State Department press release. This is all about to change with direct flights to Fortaleza from the United States coming soon. Miami-Fortaleza in less than 6 hours! spend a few months of the year here! up through out the metropolitan area. The drawing above is part of The "Aquiraz Riviera" tourist complex. 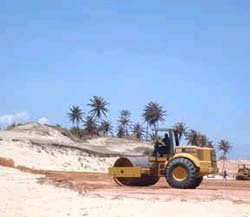 Already underway and considered the largest construction project ever in South America. 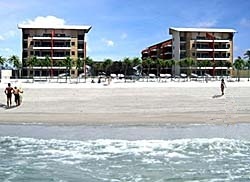 Includes 9 hotels, a shopping mall, apartments, condominiums and an 18 hole golf course (the first in the state of Ceara)! Many Brazilian investors buy early in the planning stages from a reputable builder. Selling the properties only a few years later for as much as a 40 percent mark up. This makes perfect sense for the foreign investor as well. Who may be eligible for financing with the builder. For example, an apartment or condominium that was worth R$ 150,000 in 2002 is now worth between $250,000 and R$ 300,000 in 2009. 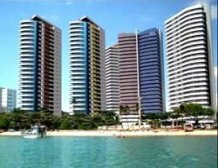 So even with the Dollar falling against the Real; Investing in Fortaleza real estate would still be considered a winning proposition when compared to many other markets in the recent past. Fortaleza real estate the best advice is choosing your agent carefully. The first mistake a foreigner can make is assuming that buying real estate in Brazil will follow along the same guidelines as back home. Another is making direct contact with a third party representing a property over the internet before choosing a qualified agent. By doing so including them in the buying process and lowering ones bargaining power. An honest real estate broker can be difficult to come by and there are many tricks for getting the buyer to spend more than is necessary and not enough space on this page to list them all. Above all your real estate agent should be trustworthy and concerned with finding what the right property is for you. Knowing that as a satisfied customer you will surely require or recommend their services in the future! No contract is required between the client and agent and they should not make you feel pressured to buy a property under any circumstances!